What’s old is new, and what’s new is old. Welcome to the inaugural edition of “Archeophone Outtakes,” a new blog from Archeophone Records. For more than 15 years, we have striven to bring America’s earliest recorded history into the present, making the sounds of the late-19th and early-20th centuries fresh and compelling for a modern audience of discoverers. If you have followed us, then you know we put everything we can into our CDs—tons of music, beautiful illustrations, top-notch scholarship—and we hope you have learned a thing or two while you have enjoyed the weird and wonderful recordings from the past. We hope you have also noticed that we have aimed to get better with each release: better sonic restoration, better photo restoration, better facts and figures in the notes. (Around here, it sounds a lot like press conferences given by Tony Romo, Tom Brady, or Andrew Luck, saying even after a great win, “We just have to get better!”) This blog is an attempt on our part to let you inside the process a little bit: to see what we’re working on, to hear the thoughts that go into the making of an Archeophone release, and to witness how we view the ancient world of acoustic-era recordings fitting into the larger landscape of American culture, past and present. So, what’s a little bit old webwise—a blog—is new to Archeophone. But what’s old to us—these crazy ancient sounds—we’ll make new to you. And we’ve got a good one coming that is pretty much the reason Archeophone exists. It’s a career retrospective of one of the first *stars* of the industry, Dan W. Quinn, called Anthology: The King of Comic Singers, 1894-1917. Let’s be honest: nobody else is going to do a CD of this guy, no matter how important we may say he was to the beginning of the commercial recording business, so it’s our special honor and privilege. We’re pumped about this one. 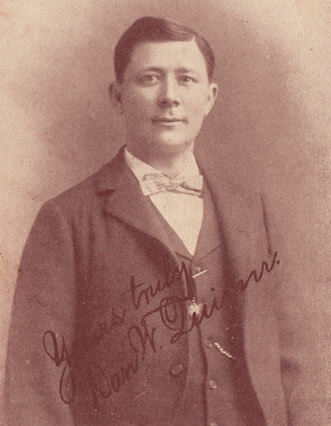 According to his own account, Quinn did recording tests in early 1892 and soon began working in earnest for the New York Phonograph Company and New Jersey Phonograph Company. These very earliest cylinder recordings from 1892 and 1893 are extremely hard to find today—not so much because they are old, but because they were played. In those days, before many consumers owned phonographs privately, the way you heard records was to patronize street exhibitors or phonograph parlors and put a nickel in the slot to listen through tubes to your selection. The proprietors played the records until they wore out, discarded them, and purchased new ones; but if a popular selection was getting long in the tooth, that was it. So let’s imagine that one of Quinn’s timely hits (his stock in trade) got played by the exhibitors over and over, but by the time they wore out the last copy, the song was passé. That means no new order, no more recordings of that song by Quinn, and it’s almost as if the whole thing never happened, from our perspective today. But over the next few years, things changed. A booming market; increased home sales of phonographs, graphophones, and gramophones (you know the differences, right? ); and expanded distribution meant a proliferation of wax phonograms. Today we reap the benefits of those developments by being able to find a few choice early Quinn specimens in the collections of private individuals who have preserved them. We start the set off with a popular British song from A Gaiety Girl entitled, “The Private Tommy Atkins,” which Quinn may have recorded during his much ballyhooed two-week marathon recording session for Columbia in Washington DC in the early fall of 1894. It’s actually out of character for him, being more a serious reflection upon patriotic themes than his usual comic fare. Then we move to a song that Quinn co-wrote himself: “Lindy, Does You Love Me?”—also recorded in about 1894. It’s a little rough, but it’s a priceless aural document, given that the popular singer is also the lyric writer. You can see the entire track list for our Dan W. Quinn Anthology on our website. We’ll be highlighting other fascinating aspects about Quinn’s life and recording career in this space over the next few weeks until release day. I really like Quinn’s personality – he’d probably be one to drink with on a Saturday night. I’m very grateful for the niche market that Archeophone offers in terms of living history, and D.W. Quinn is definitely the cream of the crop, on par with Cal Stewart’s comic fare as Uncle Josh Weathersby – “I Want to Go to Morrow” is a pleasure to behold, and if “Didn’t He Ramble” is a version of “Derby Ram,” I’ll really be pleased. Here’s prayer that Quinn sees more reissues in the future; this inaugural edition will be a favorite of mine, I know. As Dan W. Quinn’s youngest granddaughter (born just weeks before he passed away) I want to thank you for this. The family is very interested in him and his legacy, especially one of my youngest twin daughters . You will note that I have taken the Quinn name back. Also, my other twin daughter has taken the Quinn name as part of her ‘pen mane’. We are thrilled to find this information!